Garden of Aaron: Signs of Life ... and Death? Signs of Life ... and Death? With the shot of warm air that finally hit Middle Tennessee yesterday (and looks like it will stick around for a while), I had the urge to go out and stroll the garden, taking photos of comeback kid plants and those that have put on a disappearing act. The pink camellia (not sure of the name since it was here when we moved in) is still going strong and covered in blooms. I only fertilize this plant once a year with an acidic natural fertilizer! 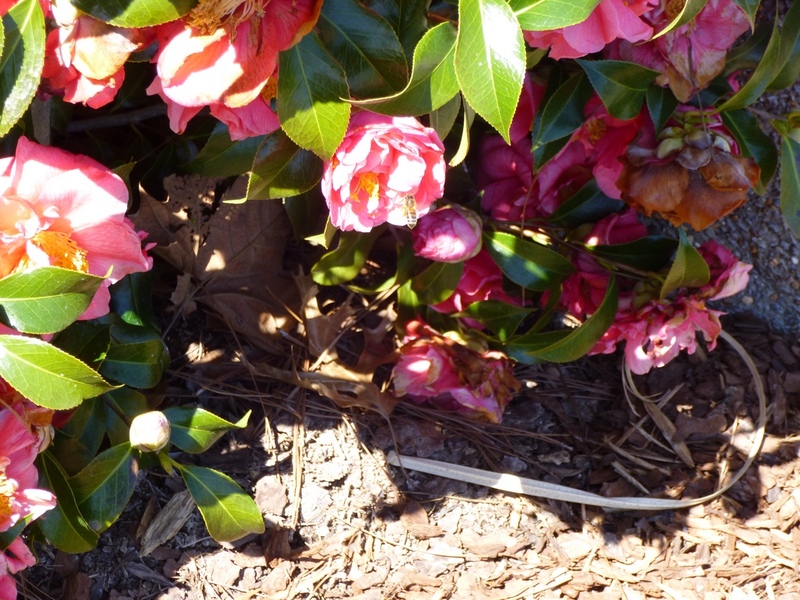 Yesterday was the first day this year to see a bee working the camellia bush. Definitely a sign of spring! Phlox paniculata 'David' - tall garden phlox. I planted three small plants back in 2011 (so two years ago). All three have come back and multiplied. From one initial stalk on this particular one, it looks like I have about a dozen stalks this year. Exciting! I was worried that I had killed my Rozanne Geraniums by transplanting them twice last year - first from the full sun back of the house to the afternoon shade in the front. Then transplanted them again to bring these low plants closer to the front of the border where they would be more visible -- and also because I needed the space to put in an oakleaf hydrangea (see below). Anyway, I'm pretty sure these small leaves are the reemergence of one of the Rozanne Geraniums. 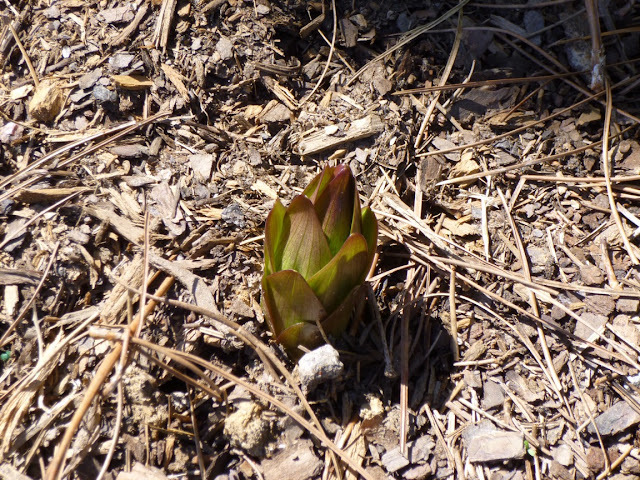 I see another plant emerging nearby. So that's 2 out of 3 (at least). Not bad for plants that were manhandled roughly last year. I forgot about this lily altogether until I saw it pushing up boldly in the front of the house! We put in three Stargazer Lilies when we moved in back in 2011. I remember the two in the back of the house in full sun, but the one in the front in afternoon shade has never done much. It looks really strong this year though so I have high hopes! This is the oakleaf hydrangea I mentioned above. The new leaves are unfurling at the tips of the branches even as the old leaves still hang on. 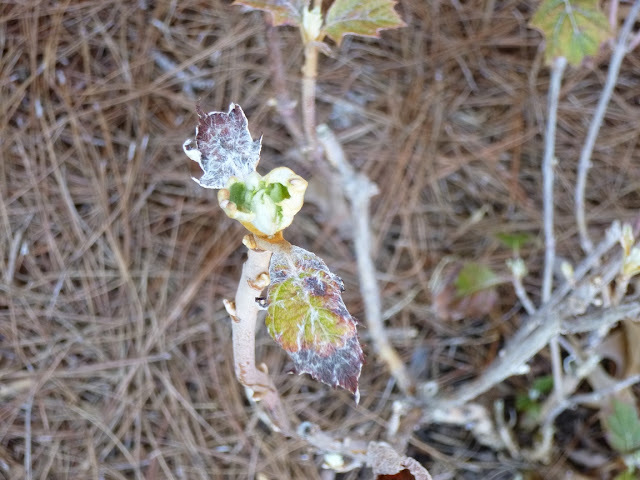 I'd say that our oakleaf hydrangea was semi-evergreen in its first winter, but the old leaves are still beautiful - colorful and almost like they are etched with frost. I think it's exciting to see the new and the old side-by-side, each beautiful in its own way. Look forward to watching this plant undergo its metamorphoses throughout the year. And now for some not-so-great news. As you can see, the buffalo grass patch is still looking pitiful. Not a single sign of green on any of the tufts. They might be dead for all I know, or maybe just still dormant. 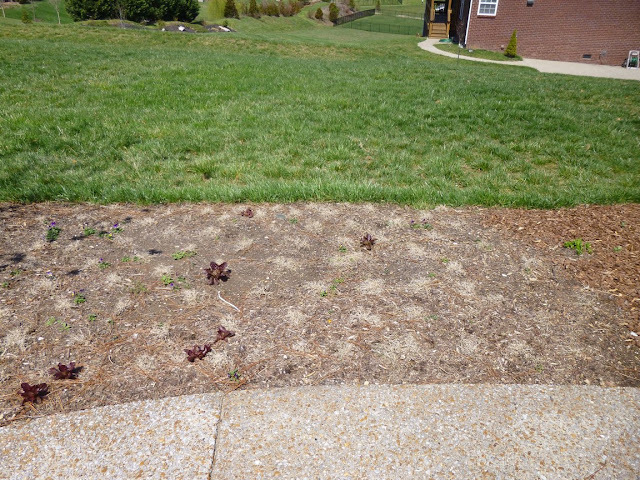 Either way, I can't imagine planting a larger patch of buffalo grass here in Middle Tennessee. Even if it is low-growing and green in the summer, I can't imagine having the lawn look like this (or a version of this with the dormant grass more filled in) during 5-6 months from November to April. 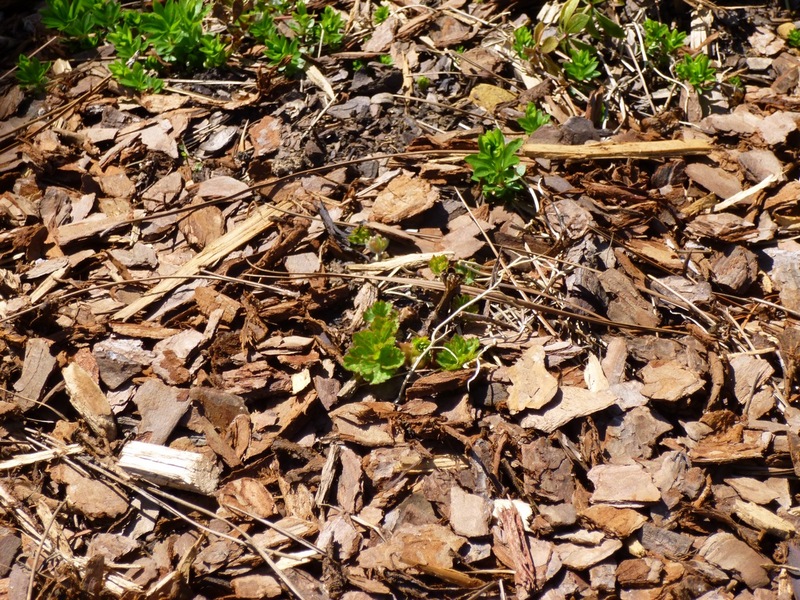 Trying to find the bright side of the ridiculously awful buffalo grass, I will say that all the spaces between the dormant tufts provide room for self-sown annuals like this volunteer lettuce to pop up. I plan to eat this soon. It looks better in real life than in this top-down photo. This is Geranium maculatum, just purchased via mail order. I don't have a good feeling about this plant to be honest (or most of the other plants that arrived in the same order). The plant is quite small and some of the leaves have died since I planted it. But Geraniums are kind of tough plants (see the Rozanne above that I transplanted twice last year and still survived) so I'm hoping this one will pull through. I put it near the Rozanne to have a nice mixed Geranium area. That's the idea anyway. 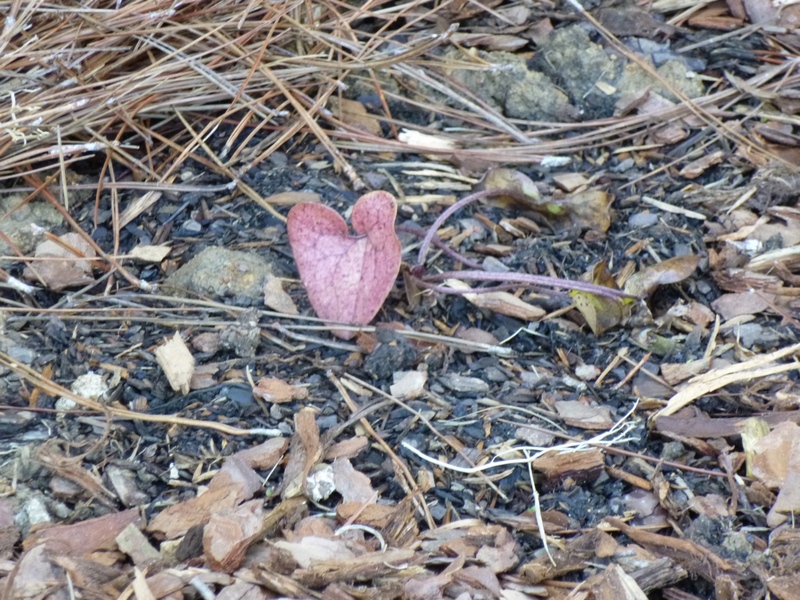 This is Hexastylis arifolia, an ornamental ginger native to the Southeast. It arrived in the same mail order package as the Geranium maculatum above. Again, I think it's looking really pitiful. Only one of the leaves is hanging strong and the rest of the stems have pretty much keeled over. I'll give it time to recover, but I don't think it's looking good. 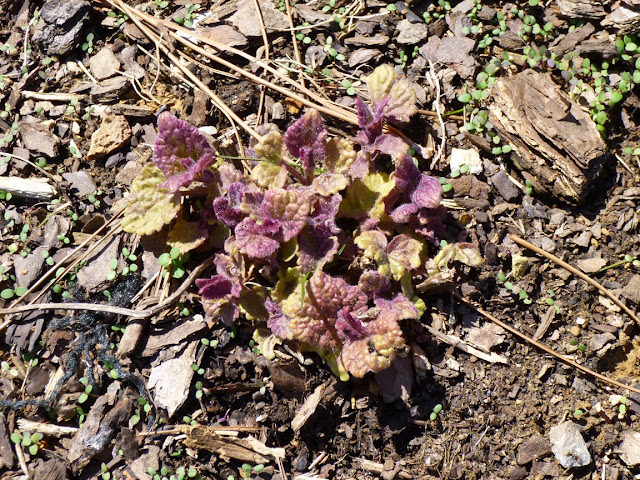 I don't have the tag for this anymore, but I believe this is a variegated variety of Agastache foeniculum, a.k.a. Anise Hyssop. I bought this plant late last autumn and it did not have much time to settle in before it went dormant for the winter, so I was a little worried about it, but it seems to be coming back nicely this spring. 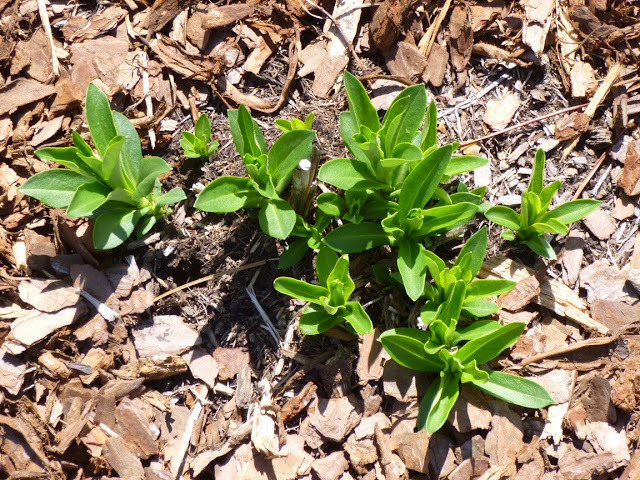 It is actually supposed to prefer full sun (I have it in an afternoon shade setting) but it's related to mint and mints like moist soil and the full sun areas on my property tend to bake and dry out in mid-summer. 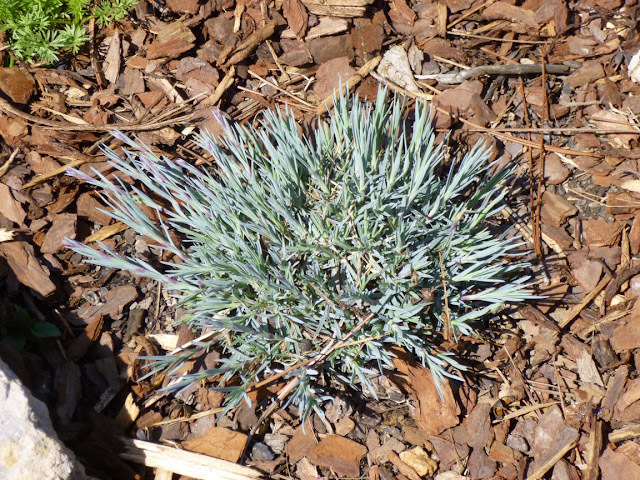 So even though it is supposedly drought tolerant, I placed it in afternoon shade. So I may not get as many flowers as I would if it were in full sun, but hopefully the plant will survive and thrive. If I ever get another one, I'll probably try it in full sun just to see what happens, but I'm trying to minimize supplemental irrigation in my garden and find plants that can survive just on rain water (with an occasional assist in extreme droughts), and I'm not sure that Anise Hyssop would fit that bill in a full sun setting. Here's another plant that I added late last year. 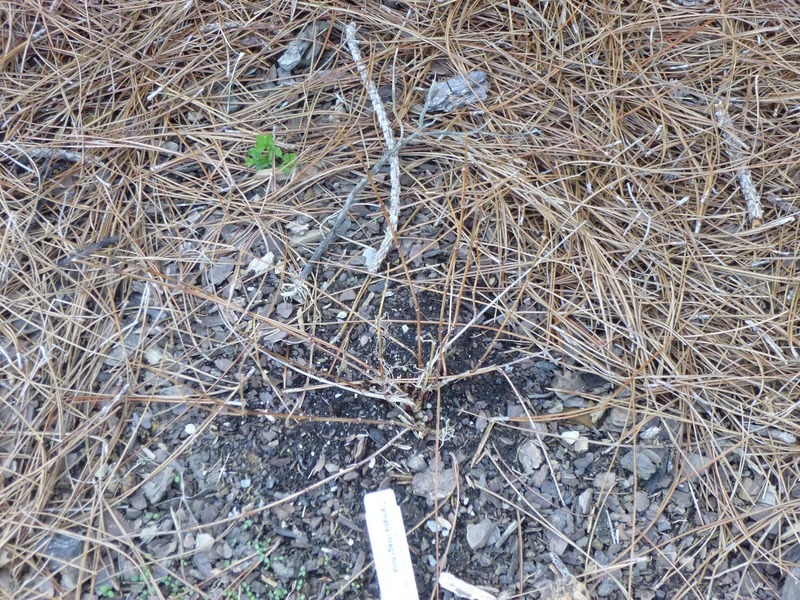 It's hard to tell what's going on from this photo, but trust me when I say this is a top-down view of a dogwood that was sort mistreated by being partially buried alongside a brush pile last winter. 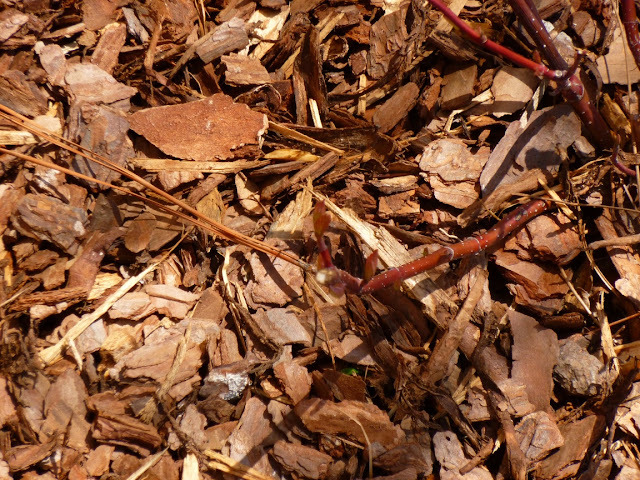 Some branches were broken and/or perhaps nibbled by the mice who made their home in said brush pile. 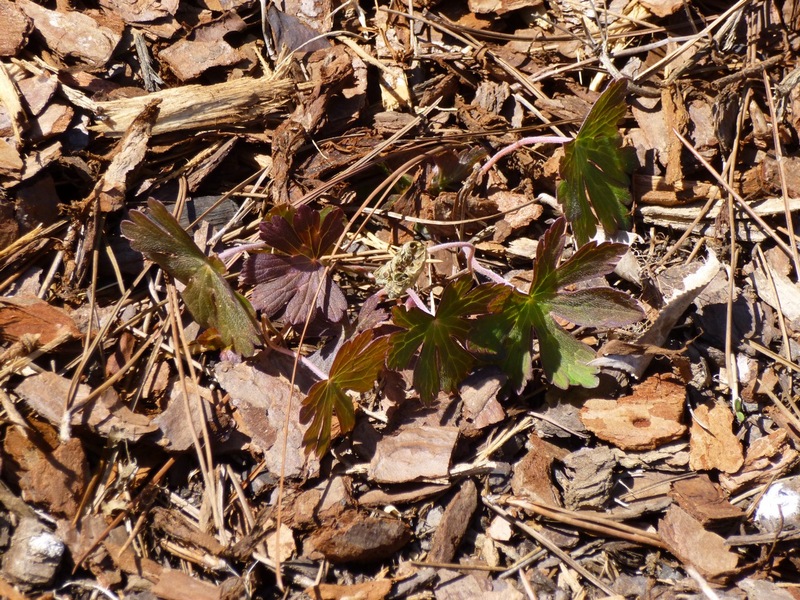 Nonetheless, the dogwood seems to have pulled through and is starting to leaf out! Exciting stuff!! Here's another perennial with a reputation for breaking dormancy late in the year. But it's still up and growing before the Hardy Blue Plumbago. 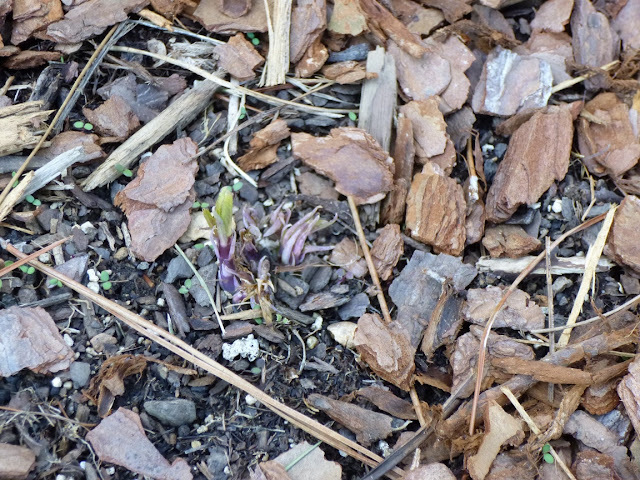 You're looking at the emerging stems of the balloon flower - Platycodon grandiflorus, Mariesii variety. Again, I added this late last year and it still flowered prettily in the autumn, but I was not sure if it had time to settle in before winter. Looks like it did just fine. I love the fleshy purple stems. I believe Platycodon is supposed to be long-lived and able to thrive with little human care. My kind of perennia! Plus the flowers are amazing. 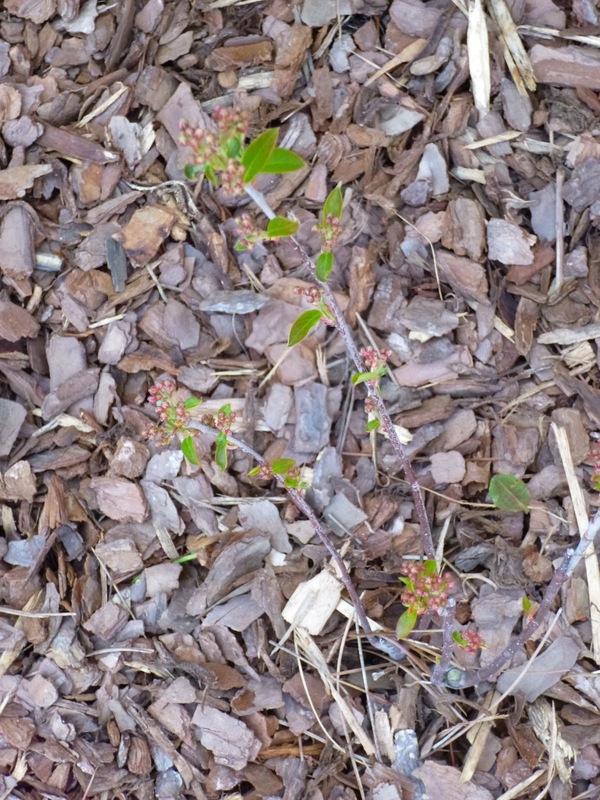 Again, it's a little hard to tell from this photo (given the difficulty my camera has with focusing sometimes), but this is Aronia arbutifolia Brilliantissima variety. All three of my aronias struggled with the heat and drought last year, but they all pulled through and are leafing out nicely. 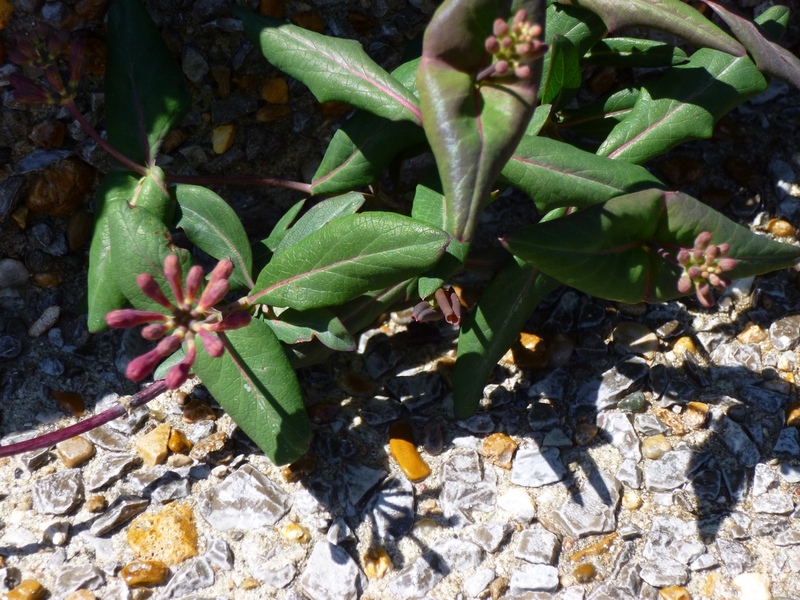 The two A. melanocarpas on the other side of the front steps are a bit smaller, but this A. arbutifolia has lots of leaves and seems to be covered with buds. I'll be amazed if it blooms when it is this small (only about 12-18 inches tall) but it looks like it might just do that! Wow. From the looks of your images, it looks like life is winning, Aaron. Huge congratulations to you and your plants for surviving a hard winter. Wow, where do I start? First of all, it looks like you have a lot of promising plants going there, and for some reason I'm thinking many of them will pull through. That Buffalo Grass situation is strange. Is it supposed to grow in your area? Regarding the Asiatic Lily, a word of warning: Do you have deer or rabbits in the area? If so, you might want to put up a fence or some kind of barrier (repellent plants?) around the Lily. Rabbits will eat them down to the ground. If you don't have deer or rabbits in your area, never mind. That Lettuce is making me hungry! Thanks for the comment! I'm hopeful that many of the plants will pull through as well. (I'm confident that Hardy Blue Plumbago will make an appearance *eventually* ... I'm just not sure I want to add to the Plumbago patch if it'll be so late every year. 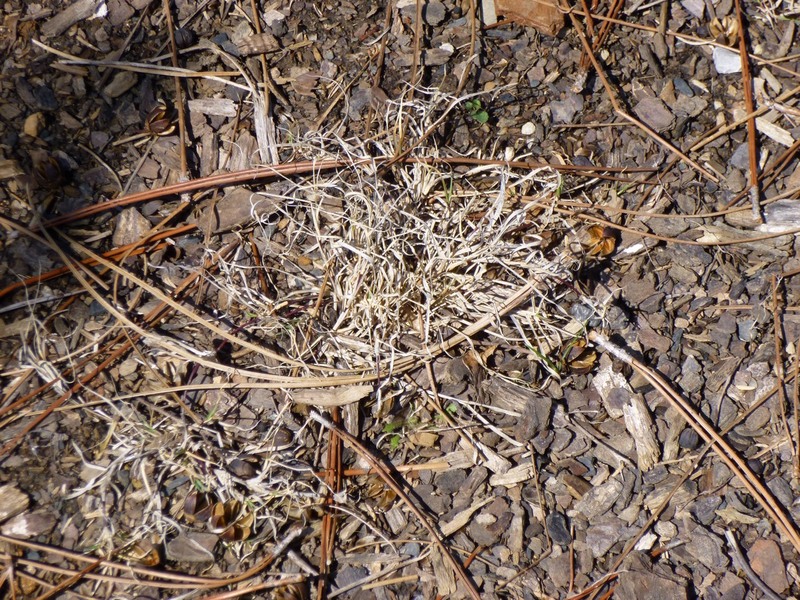 Buffalo Grass is really more of a Western Plains kind of plant. 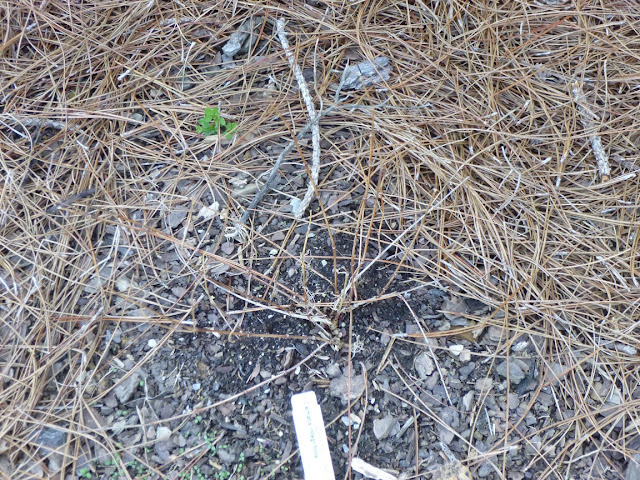 It's not supposed to grow in the Southeast -- although I did buy a cultivar that was *supposedly* bred to withstand higher amounts of rainfall and humidity. And it's supposed to do fine in clay soil. But I'm thinking that the combination of clay and winter rain (rather than dry winter or snow) may have killed it. 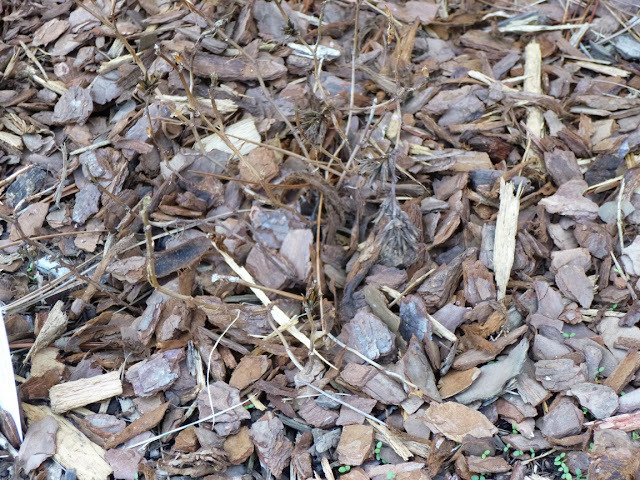 Alternatively, it could be just another long dormancy plant (like the plumbago). Thanks for the advice on the lilies. We have rabbits and deer occasionally, but I've never seen them take a bite off the lilies. (But something DID chomp down on some of my young coneflowers last night. From the fact that it looks like stem was ripped off (rather than daintily nibbled) I suspect deer! 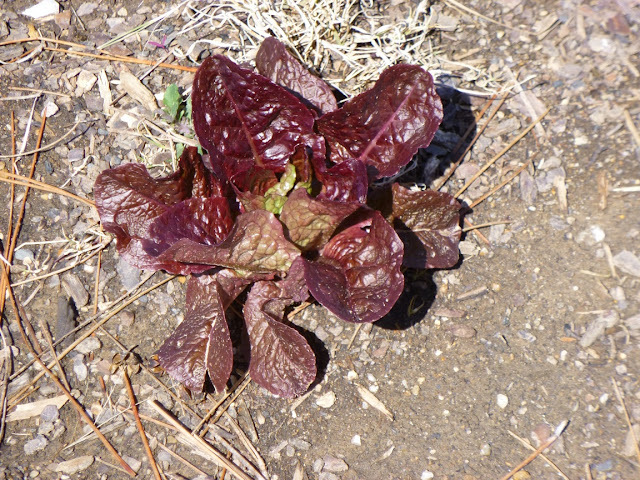 Volunteer lettuce...wow...I love seeing allt he new growth especially that lily. Of course as Beth mentioned above, my deer would love it too. Yep, volunteer lettuce :) I let one or two plants go to seed last year and I'd say that I got at least around 20-30 volunteers. I didn't fertilize any of them and they lived through the winter (lows in the 20s and teens) unprotected, though some of them got a bit damaged and tattered. I picked oh about half-a-dozen small heads the other night. Made for a couple nice bowls of salad for my wife and me. Aaron, Things are looking up, finally! I agree with you on violas and violets (I think you have a viola there). I love them! 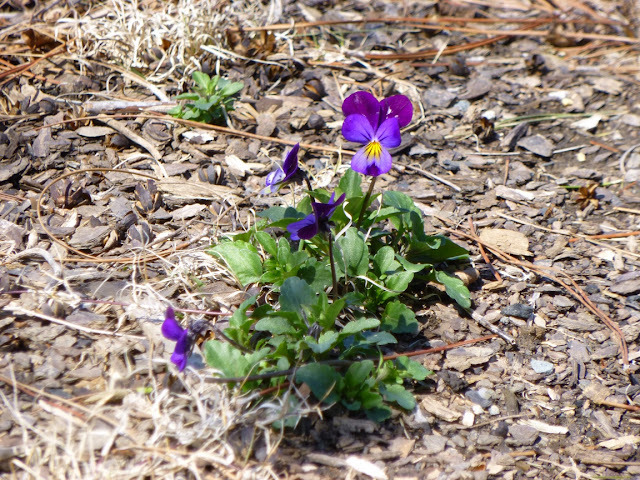 One year I planted different violas, and the next year I had a million johnny-jump-ups. They were all over the yard, but I loved every single one of them. Don't worry about the Ceratostima - it's very late in coming up. It makes a fine groundcover in summer and fall, but it's dormant for half the year. I tend to forget I even have it in my garden until I'm surprised by it in late spring/early summer. 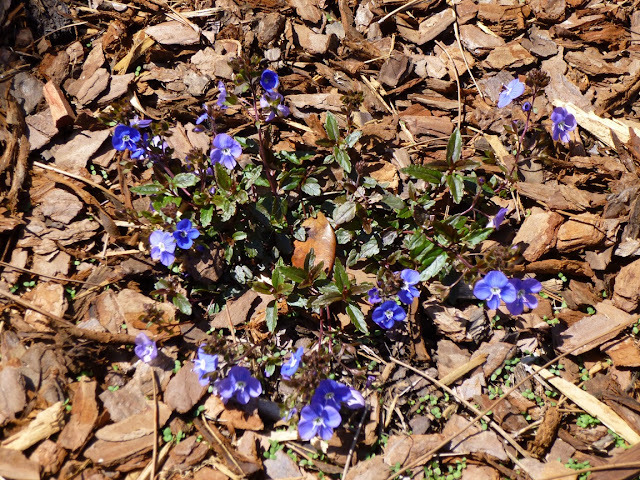 I still like it: the flowers are true blue, and the foliage turns deep red in fall. Lots of things coming up! Dianthus firewitch is one of my favorites. It blooms so cheerfully in the spring, and mine has seeded itself in an area of gravel. I bet this year you'll be very happy with it. 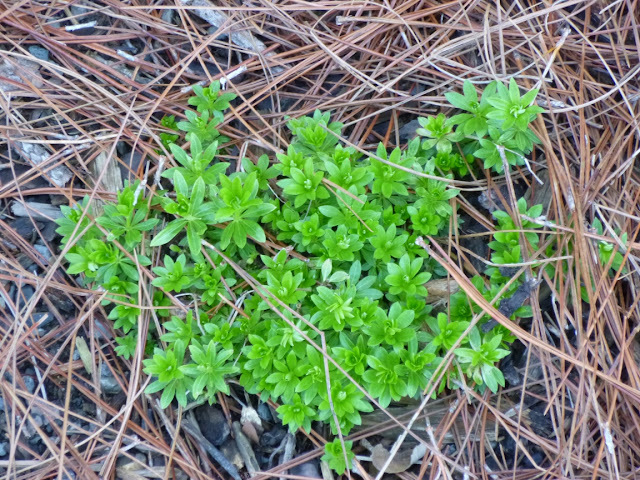 I have been thinking about adding some sweet woodruff to my garden. I will check out GITWOGC. You're Dianthus firewitch reseeded?? Ooh! I hope mine does that! So far I'm loving the Sweet Woodruff. It definitely shines in spring and autumn. It looked a little tired last summer in the heat and drought, but it pulled through without any obvious dieback. You have a wonderful start on spring; your spring should be quite amazing. Some of the plants you put in to the ground may take a couple of years to get started and come into full bloom. I agree. It may take a little while for the perennials to settle in. While some of older perennials seem to be declining (Gaura, Russian Sage), others just seem to be hitting their stride. I guess it's true what they say about many perennials, shrubs, etc. -- The first year they sleep, the second year they creep and the third year they leap! Sprouting Seeds - The Adventure Begins!